Nu-Perspective, home of revamps and updates of various forgotten and under-developed Nubian (black) characters, is back a little later than expected but back none-the-less. And we’re closing out November with a character from the home of DC, JAKEEM THUNDER!!! As always, we encourage you to employ the amazing world of Google and check out his original look and story, then let us know if you like what we did with him. Enjoy and catch you in a few with another Nu-Perspective. Story: Jakeem was orphaned and raised by his aunt in Keystone City. Due to his rough upbringing, he adopted a tough, foul-mouthed attitude to survive. However, Jakeem became a reluctant hero when he was handed a pen and told to say the words “Zo Kuul” (pronounced “So Cool”). Uttering these words summoned a pink Djinn in the form of a sentient, humanoid lightning bolt. Hitting the proverbial jackpot of wish fulfillment, Jakeem joined the ranks of the JSA and fought in numerous battles, becoming a trusted member of the team. Both Jakeem and The Thunderbolt went through many trials that shaped them into beings with different perspectives than when they originally met. Another change was Jakeem found out he could now house The Thunderbolt as an app in his smartphone. This level of symbiosis alerted other Djinn from The Thunderbolt’s home plane of the 5th dimension who resented the centuries of human’s controlling Djin. To compound matters, Jakeem and The Thunderbolt must also work together to stop a mysterious antique dealer from collecting the other five artifacts connected to the Thunderbolts family and using the djinns’ powers to dominate the world. 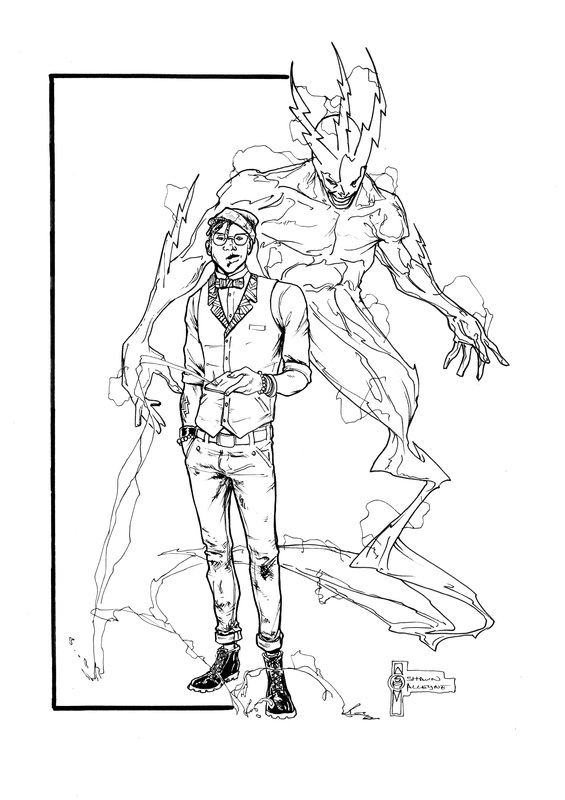 Powers/Abilities: Ylzkz is a 5th dimensional being typically understood by humans as a “Djinn” from Aramaic myth. They are beings of sentient energy of varying size, color, and composition. Ylzkz possesses vast reality warping powers which are manifested in granting wishes through verbal or written commands from his “master”. 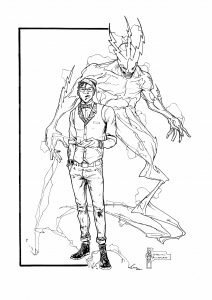 The full extent and duration of these powers are limited, as, by Djinn standards, Ylzkz is very young and inexperienced, leading to many unexpected consequences, exacerbated by his immaturity and spitefulness. While 5th-dimensional Djinn are capable of enacting arbitrary and obtuse rules and limitations, they are universally incapable of killing a “master”. Jakeem himself possesses no outstanding attributes other than an inexhaustible well of pop culture references, and a quick wit. Paraphernalia: Jakeem’s phone has become the “home” of Ylzkz, who must return to it every 24 hours. For a yet unknown reason, no other person can use or summon Ylzkz even if they possess the phone or say the “magic words”. Jakeem can only summon Ylzkz by manually activating the app and saying “Zo Kuul”. Because it is Ylzkz’s home, it has magically become virtually indestructible, and never runs out of power (*some charges may still apply with data use). Hailing from the eastern-most Caribbean island of Barbados, Fabian Wood has long since been fascinated by the power of storytelling to inspire and invoke emotions – whether in film, comics or video games. No longer content to be just an avid comic book reader and videogamer, he’s eager to exercise his literary acumen as an aspiring writer and reviewer. Born and raised on the island of Barbados, Shawn later relocated to Philadelphia in his teens, where he has lived ever since. He is currently working in the demanding field of freelance art as a Writer, Illustrator and Instructor. Shawn constantly seeks to promote the arts, and so formed the comic book networking group Xion and the art group Artmada. Shawn’s personal work is produced under the Pyroglyphics Studios banner, a name roughly translated to “Hot Images”, meant to reflect his gritty self-taught style.